I stop pakai Rosa E serum tu selepas dua botol sebab I cuba serum yg lain, tapi setelah beberapa lama, I rujuk balik dekat Rosa E serum tu. Nak dijadikan cerita, masa I nak beli tu tengah promosi Rosa E dengan Grape E ni. Being the cheapskate me, I pun beli la sebab promosi kan. I was skeptical at first to apply this serum during my morning routine. I wanted to use this at night tapi hellooooo my Rosa E pigmentation serum pun perlu digunakan? So I decided to give it a try. Instead of using 5 drops as recommended, I only use about 3 drops (sometimes less but never more), and guess what? My skin loves it soooooo muchhhhh. After using the serum, my skin is soft, and have that dewy look. Most importantly, it is not oily sampai tahap boleh goreng minyak. I am sorry I doubted you Grape E.
I am still in my 20s so the part where it claims to delay the early signs of aging tu I hope its true. Probably kalau I konsisten pakai, masa I umur late 30s tu orang ingat I muda remaja lagi la kot? Tapi apa yang I boleh kongsi, kulit I setuju dengan serum ni. Kulit I ni paling manja salah sikit breakouts tapi dengan Grape E serum ni, dia macam okay beb I approve your choice this time. Yes it is an oil but it absorbs so easily into your skin and when you continue to apply your sunscreen and foundation, it is amazingly smooth. Serum ni dah masuk dalam morning routine dah cuma kalau I malas tu, hm tak boleh nak tolong la. At the moment, no new pimples, not clogging my pores yeay! Tapi, ha jap. Remember when I said that the Rosa E Pigmentation Serum ada this oily smell. 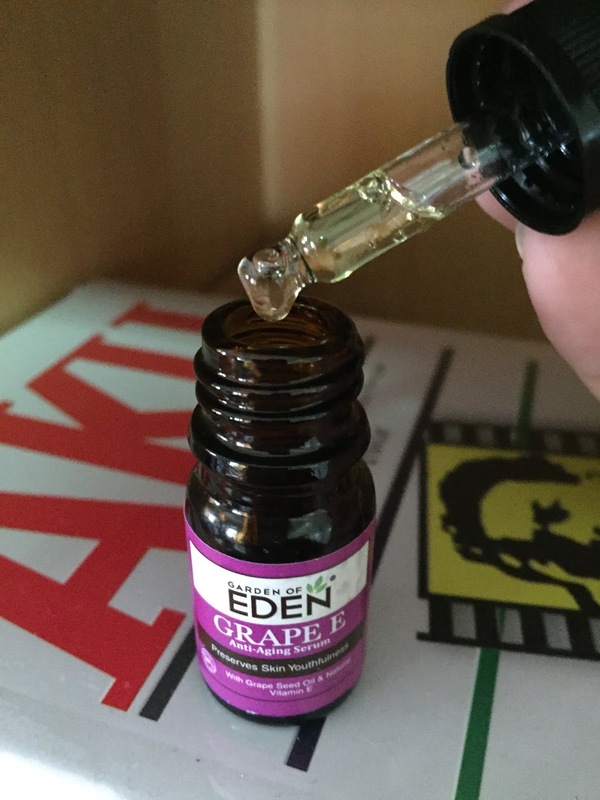 Update : the one that I bought this time, does not have that oily smell anymore buuuutttttt that oily smell somehow is at this Grape E Serum. Again, it is not unpleasant, the smell will be gone after the serum is absorbed, but it is not a nice smell either. No it does not sting, but you will notice the smell. How can I describe the smell eh. Ha! You know your newly opened cooking oil? The unused one, the smell is something like that. Anyway, it is just a minor problem compare to what it benefits me. So its okay, I'll live with it. Gitu. 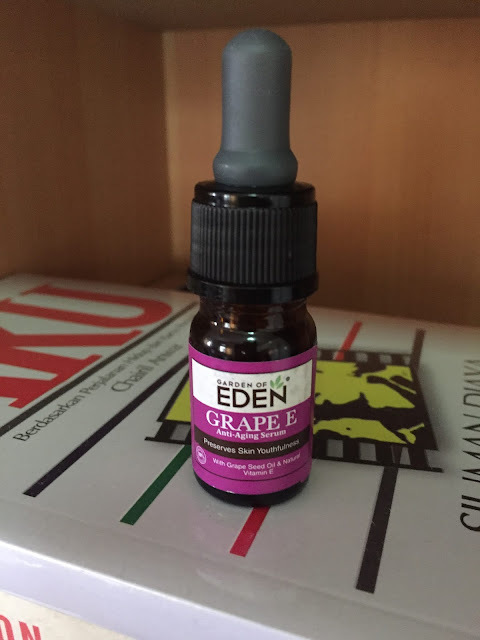 Okay dah boleh serbu dan cari serum Garden of Eden yang bersesuaian dengan hampa. Good luck!